NY Boating Course / Certification with Safe Boating America. NYS Boating Safety, Certification & Coast Guard Licensing Courses! Register today to take a safe boating course through Safe Boating America. Obtain your Boating and Personal Watercraft Certification in ONE-DAY! Learn to navigating with charts and safe boating procedures as they pertain to the waters you travel. Earn your U.S. Coast Guard License-online courses available. Get your career started in the marine industries field. Wilson Tech, part of Western Suffolk BOCES, offers various boating courses to obtain employment in the areas of servicing boat engines to operating a marina. Download the current Marine Technical Specialist brochure and see what Tech has to offer. Get started now in an exciting and fulfilling career in the marine industries. Visit My Tech Now for additional details. The maritime technology program offered at Kingsborough College is a sixty college credit program whose training is 50% “hands-on” in labs and on boats. 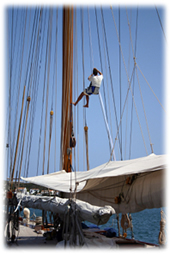 Employment opportunities as harbor captains, mates or deckhands aboard ferries and private yachts can be realized. View the scholarships available to AMI members and their families. Interested in contributing to our scholarships? Click here for more information!